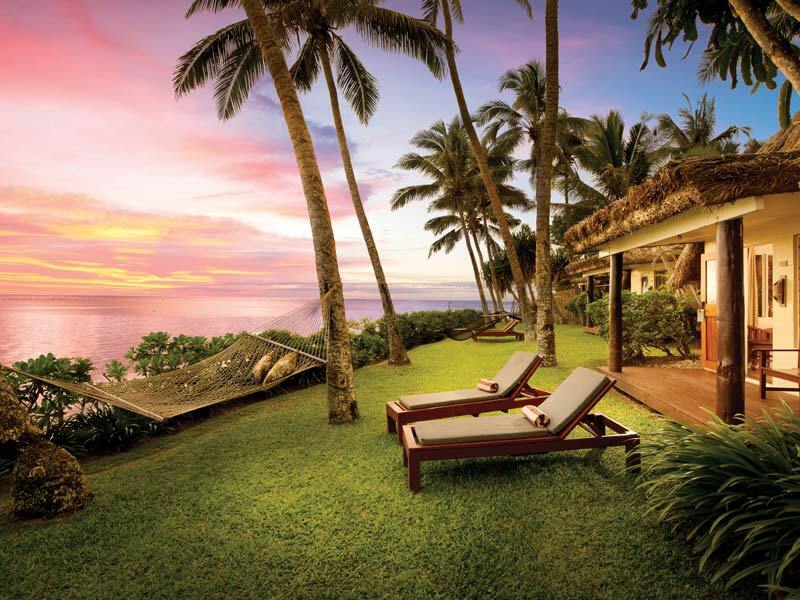 Experience ultimate luxury when you stay 6 nights in a Plantation Bure, reflecting the traditional architectural style of Fiji and large enough to accommodate 2 adults and 2 children! These rooms include an exclusive Talai Butler Service^^ with champagne & canapes served in-room daily! Start your day the right way the right way at Vale Ni Kana restaurant one of the Coral Coast’s most popular breakfast spreads! Taking the kids on holidays doesn’t have to be expensive. 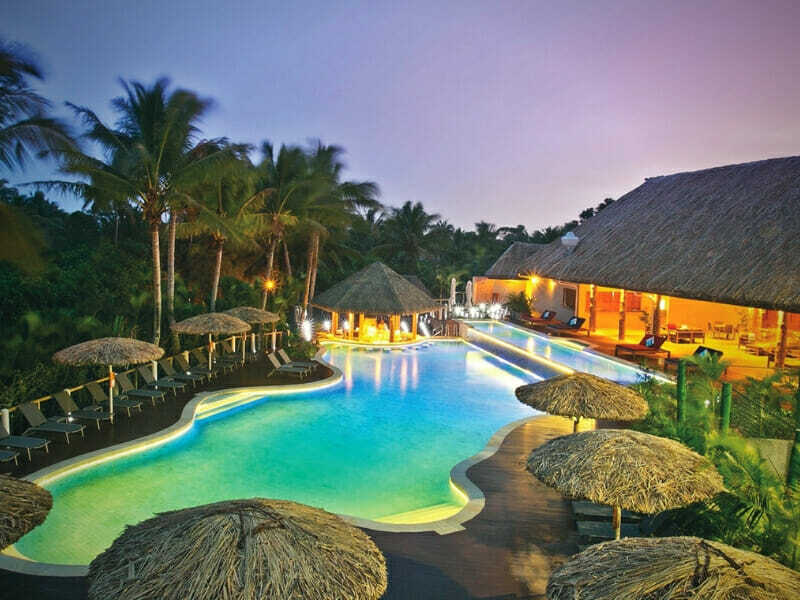 With this exclusive My Fiji package kids Stay, Play & Eat for FREE! Up to 2 kids 12 years or under stay free when sharing room with accompanying paying adult/s and utilising existing bedding occupying the same room. Kids play for free with the Little Riggers (3-7 years) and Beach Riggers (8-12 years) programs and eat free when ordering meals from children’s menu & buffet. 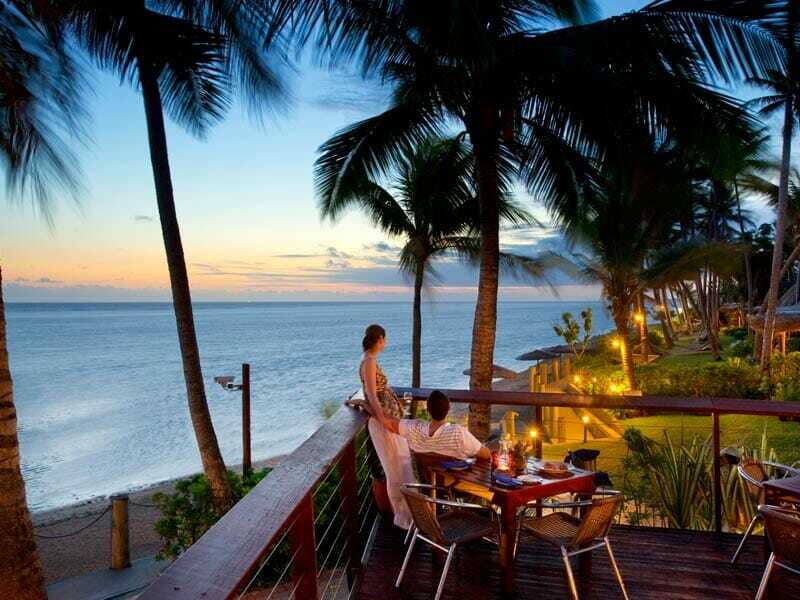 You will never get bored during your stay at Outrigger Fiji Beach Resort with these exclusive bonus experiences! Choose between 2 x 1 Hour Bebe Spa Treatments OR 4 days Meimei nanny service OR 1 x Themed Buffet Dinner for 2! Enjoy this exclusive experience for 2 adults, performed at Vakavanua Lounge. 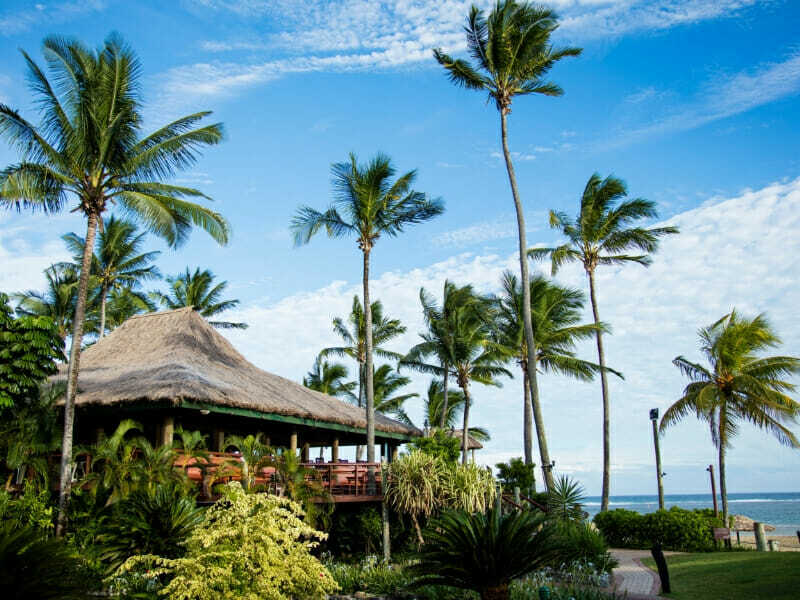 Indulge your tastebuds by sampling all six of Fiji’s finest, locally made Rum’s. You will also receive a 15% discount on all Fiji Rum purchases throughout the day. During your stay, enjoy complimentary use of non-motorised water sports equipment, and stay connected with complimentary 30 minutes of WiFi daily! You will also receive a complimentary cultural experience, by attending a Kava ceremony, and will have the opportunity to relax and unwind with yoga and meditation. Experience true Fijian hospitality with a heartfelt local greeting, including a refreshing locally inspired beverage and a cold towel on arrival! This island-style greeting is the perfect start to your tropical holiday! Ask us about adding Malamala Beach Club, My Fiji Island Experience or the Sigatoka River Safari Day Trip to your holiday experience. The Resort View Rooms are spacious, spanning across 47sq. metres, and have enough room to accommodate up to 3 adults or 2 adults and 2 children (12 and younger). You have the freedom to choose which bed configuration you would prefer with a choice of either 1 king bed and 1 double sofa bed or 2 double beds. 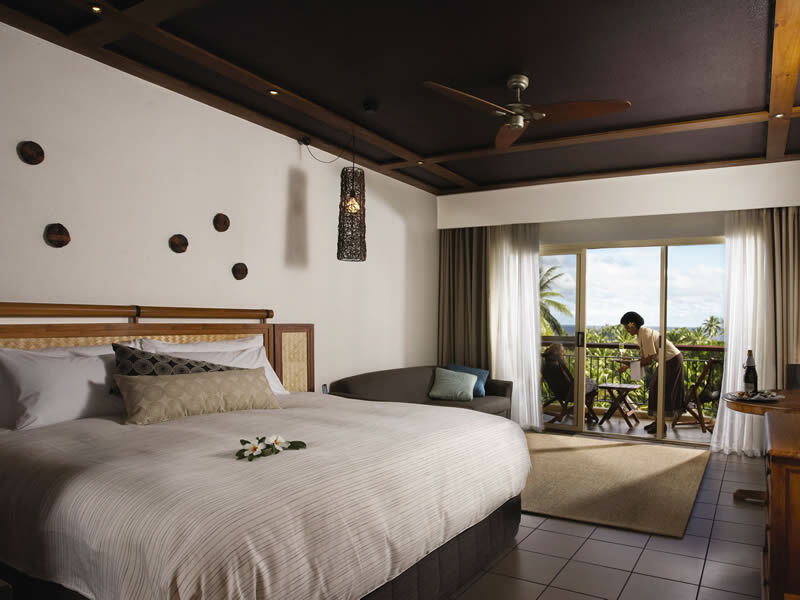 The air-conditioned rooms are decorated to reflect a South Pacific ambience combined with the luxury of a 5-star resort. Inside you’ll find modern features and amenities such as a private balcony, bathrobe and slippers, ceiling fans, coffee/tea facilities, in-room safe, fridge/minibar, telephone, TV and much more! Large enough to accommodate up to 3 adults or 2 adults and 2 children (12 and younger) the Ocean View Rooms provide a comfortable and luxurious island stay for all travellers. Depending the size of your travelling party you can choose between 1 king and 1 double sofa bed or 2 double beds for the sleeping configuration. 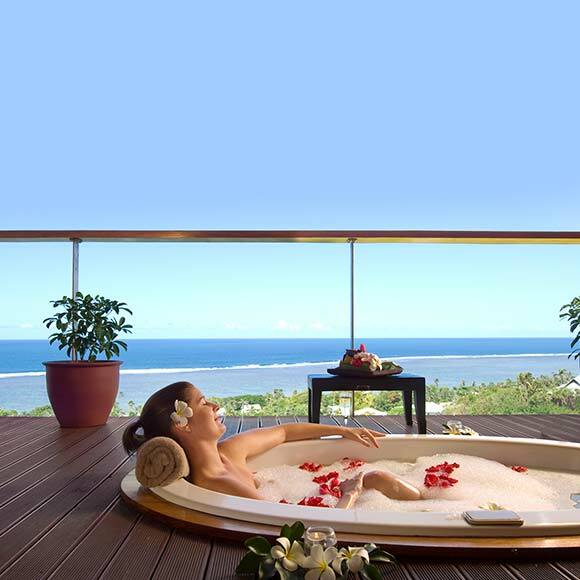 The rooms are decorated with a South Pacific ambience without comprising the luxury of a 5-star resort. The air conditioned interior spans across 47sq. metres and is complete with a spacious bathroom, bathrobe and slippers, ceiling fans, coffee/tea facilities, in-room safe, fridge/minibar, telephone, TV and much more. The room includes an exclusive Talai Butler Service from 7am until 11pm daily, including a complimentary welcome drink & cold towel on arrival, as well as champagne & canapes delivered to your room every afternoon. Reflecting the traditional architectural style of Fiji, the Plantation Bures are spacious and airy and have enough room to accommodate 3 adults or 2 adults and 2 children (12 and younger). The interior extends across 50sq. metres and is complete with a range of modern features and luxury amenities. Choose your preferred bedding configuration with your choice of either 1 king bed and 1 double sofa bed or 2 double beds. Stay cool in the air conditioning, relax in your bathrobe and slippers, enjoy a fresh cup of tea or coffee, stay stylish with the hair dryer and enjoy the tranquil garden atmosphere from the veranda. The bure includes an exclusive Talai Butler Service from 7am until 11pm daily, including a complimentary welcome drink & cold towel on arrival, as well as champagne & canapes delivered to your room every afternoon. 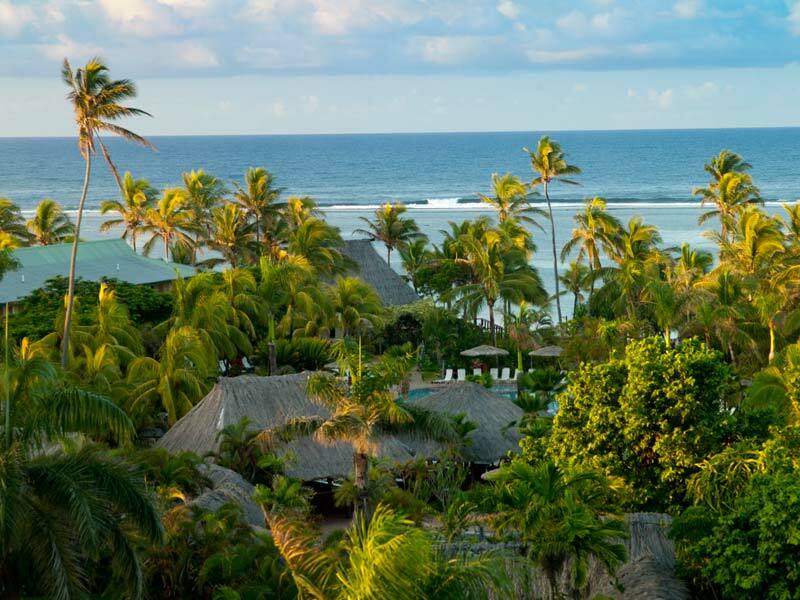 Ocean Breeze Bure – UPGRADE from only $600 per person! Catch the calming sea winds from your outdoor veranda when you stay in an Ocean Breeze Bure. These bures are designed like traditional Fijian architecture and they capture the essence of this stunning island destination. The Ocean Breeze Bures are 50sq. metres and are complete with your choice of 1 king bed and 1 double sofa bed or 2 double beds, air conditioning, bathrobe and slippers, tea/coffee facilities, refrigerator, in-room safe, TV and more. Included with the bure is the exclusive Talai Butler Service from 7am until 11pm daily, including a complimentary welcome drink & cold towel on arrival, as well as champagne & canapes delivered to your room every afternoon. Ocean Breeze 1 Bedroom Suite – UPGRADE from only $900 per person! Perfect for extended stays or travellers seeking separate living and sleeping areas, the Ocean Breeze 1 Bedroom Suites are spacious and stocked with amenities. 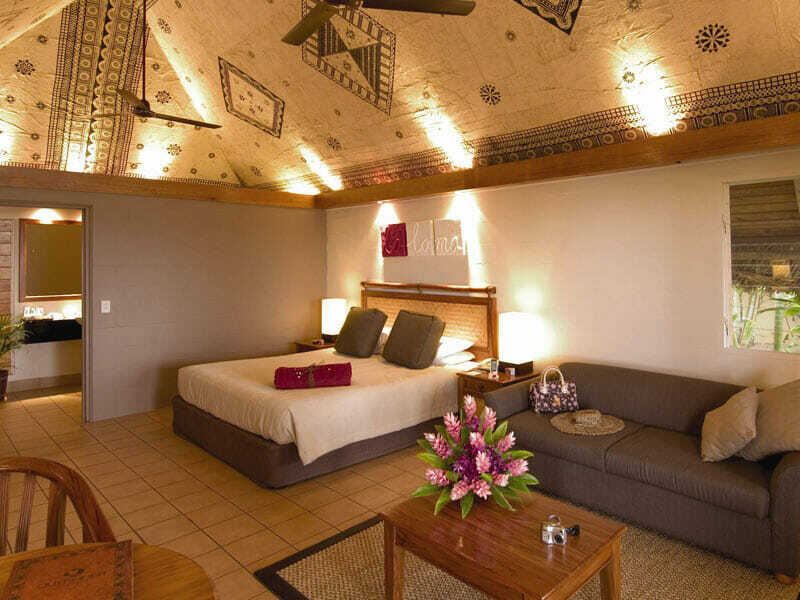 Embrace the Fijian design with earthy tones and light timbers in these 87sq. metre suites. Kick back in your bathrobe and slippers, cool down in the air conditioning, breathe in the ocean air from the private balcony, channel surf the LCD TV’s and enjoy a hot coffee made with the tea/coffee facilities. This suite includes an exclusive Talai Butler Service from 7am until 11pm daily, including a complimentary welcome drink & cold towel on arrival, as well as champagne & canapes delivered to your room every afternoon. Beachfront Bure – UPGRADE from only $1100 per person! Situated right on the beach, the Beachfront Bures are spacious (50sq. metres) and can accommodate up to 3 adults or 2 adults and 2 children (12 and younger). The rooms feature a range of amenities including a king bed, double sofa bed, TV, telephone, ceiling fans, bathrobe and slippers and more. Relax on the veranda and enjoy the stunning beach views. Included with the bure is the exclusive Talai Butler Service from 7am until 11pm daily, including a complimentary welcome drink & cold towel on arrival, as well as champagne & canapes delivered to your room every afternoon. Family Suite 2 Bedroom – UPGRADE from only $1300 per person! For those guests seeking more space and comfort in their accommodation, the Two Bedroom Family Suites offer separate bedrooms and bathrooms, daily Talai butler service with canapés and champagne in the afternoon, buffet breakfast and all the amenities and inclusions expected from a five-star resort. Keep cool in air-conditioning, keep your valuables secure in the in-room safe, enjoy a hot beverage with the coffee maker and watch a range of channels on the LCD TV. 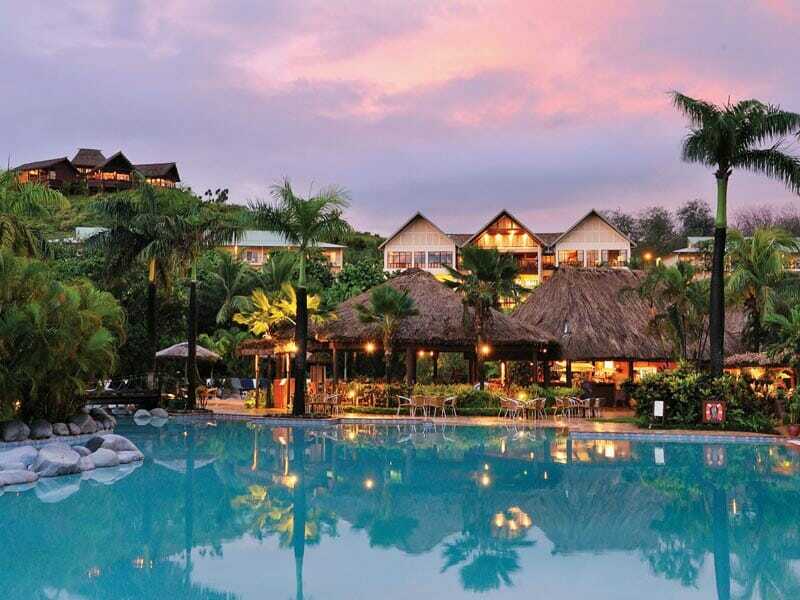 Plantation Family Bure – UPGRADE from only $1850 per person! Designed for your comfort the Plantation Family Bures are the ultimate accommodation option for families holidaying to Fiji. With two bedrooms and 2 bedrooms, the interior is spacious, 116sq. metres, and is decorated with traditional Fijian décor. Overlooking the crystal clear waters and tropical greenery, relax on the private hammock, stay cool in air conditioning, kick back on the private balcony, stay in touch with the telephone and so much more! 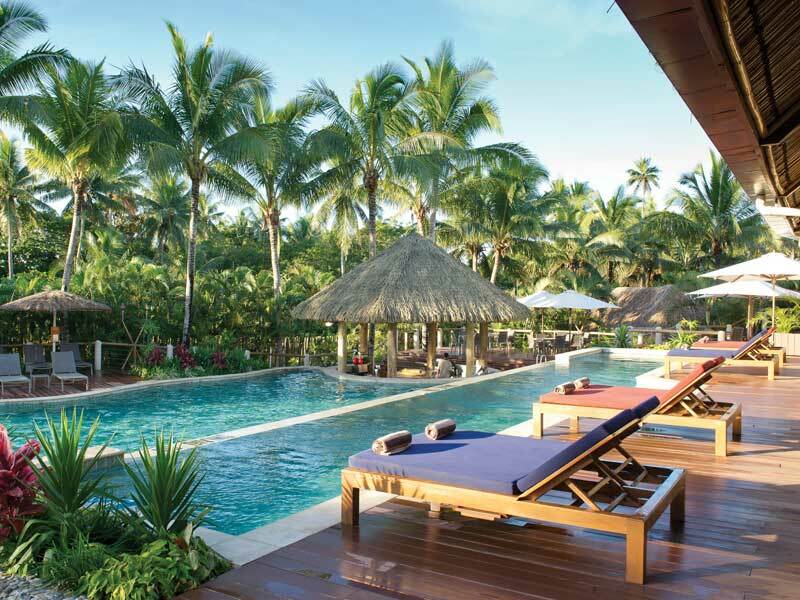 See what all the fuss is about and base your Fiji holiday at My Fiji’s top selling family resort, Outrigger Fiji Beach Resort. Packed full of 5-star amenities and services, from the fantastic family friendly facilities to the award-winning Bebe Spa, there’s something for everyone at this resort! 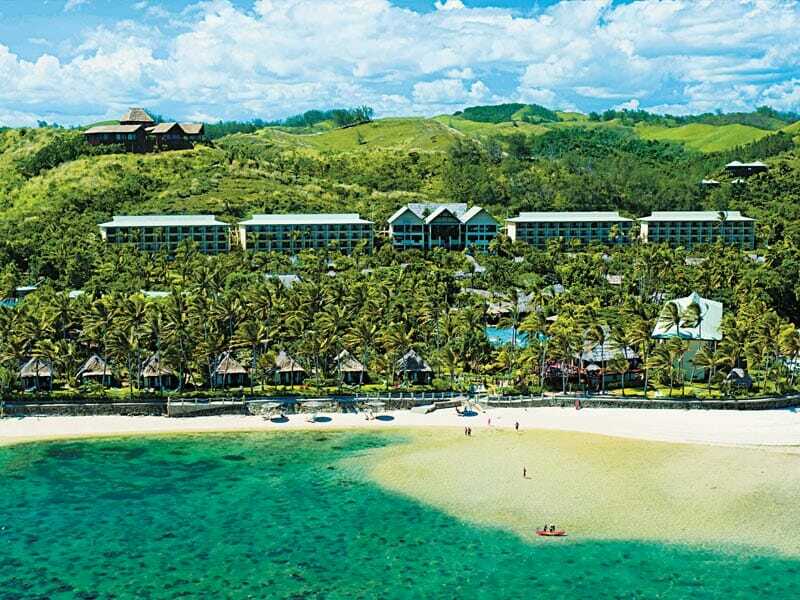 Read more about Outrigger Fiji Beach Resort here! ^^Talai Butler Service: Guests staying in Deluxe Ocean View rooms, suites or bures are offered our unique and exclusive Talai Service – traditional five star butler service with a South Pacific twist. Talai service includes complimentary welcome drinks, cold towel, and champagne and canapés delivered every afternoon to your room. Talai butlers are available to unpack and iron your clothing, recommend tours and activities, and make restaurant reservations. Our Talai butlers provide you with a style of hospitality that is truly a special feature of Outrigger Fiji Beach Resort. Available 7 am – 11 pm daily. #Kids Stay, Play & Eat FREE: Up to 2 kids 12yrs or under stay free when sharing room with accompanying paying adult/s and utilising existing bedding occupying the same room Kids play for free with the Little Riggers (3-7 years) and Beach Riggers (8-12 years) Programs. 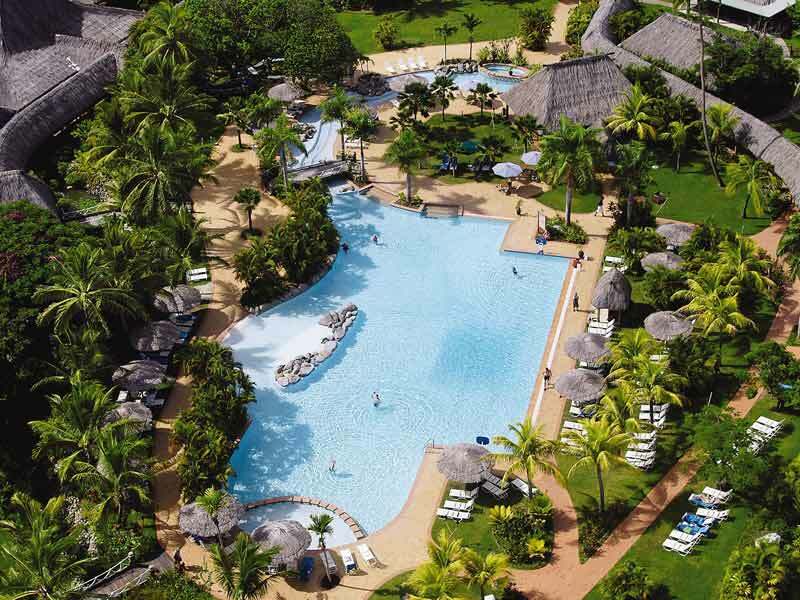 Enjoy a full day of activities from water polo at the spectacular pool, to an afternoon of fun Fijian games. Up to 2 kids 12yrs or under eat free when sharing room with accompanying paying adult/s. Applies only to meals ordered from the children’s menus or the resort’s children’s buffet, whichever is operational at the time of stay. Excludes room service and Ivi Restaurant. ~$1000 Wine, Dine & Spa Credit (per room per booking): This resort credit can only be used at the owned and operated Outrigger outlets, namely all resort bars and restaurants (including room service), in-room movies are OK, the Bebe Spa (for massage and treatments only) and resort activities such as the Golf Driving Range and the weekly Fire Walking Show etc. It cannot be used in any of the resort shops, boutiques or non owned F&B outlets like the NZ Ice Cream outlet; it cannot be used on day tours booked through the Rosies Tour Desk etc. *Choose 2 of 3 Bonuses: 4 Day Mei Mei (Nanny) Package – Package includes 8 hours of service per day for a total for 4 days. For children aged between 6 months and 12 years only. Each meimei can care for only one child between 6 months and 2 years in age, or two children over 2 years in age. 2 x 1 Hour Bebe Spa Treatments vouchers are non-refundable, non-transferrable and non-redeemable for cash. 1 x Theme Buffet Dinner for 2 Adults & 2 Children – Includes 1 x Theme Buffet Dinner for 2 Adults at Vale Ni Kana.